Sociologist Patricia Hill Collins opens this brilliant new book on race and education by describing how in her senior year at the Philadelphia High School for girls, near the end of a public school education that “had almost silenced me,” she was invited to deliver a graduation address on the meaning of the American flag. She refused to deliver the censored version her teacher demanded, and someone else took her place on stage. Collins begins, in a tour de force of social analysis with practical implications, by demystifying what she calls “racism as a system of power.” She argues that the generation coming of age at the turn of the twenty-first century—in a post-civil-rights society that publicly claims to be “color-blind”—needs a new language for analyzing the new “color-blind racism” of contemporary society that has stymied efforts to live up to the promise of American democracy. She shows us how racism as a system of power works in four distinct yet intertwined domains—structural, disciplinary, cultural, and interpersonal. Drawing examples from schools, politics, pop culture, personal experience, and more, she demonstrates in eye-opening ways how racial inequality is manufactured and reinforced, even as we publicly espouse an ideology of color-blind fairness. And she points, crucially, to what we can do about it. Noting that everyone is situated differently in the complex domains of power, she urges us to “think expansively about resistance,” to figure out in which domain we can have the most effect in resisting racism as a system of power, and how. She also discusses classrooms around the country, teaching as a subversive activity, “cultivating countersurveillance,” and the power of storytelling and media. Blending entertaining storytelling, social theory, and practical suggestions for changing institutions, including schools, Another Kind of Public Education is both a call for change and a reminder that public education—in every sense—is at the heart of American democratic possibilities. 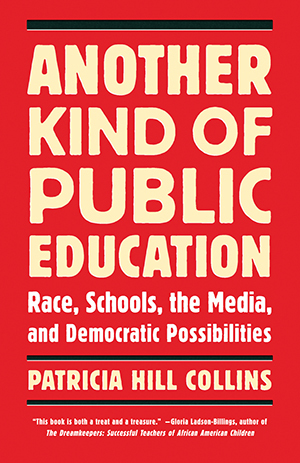 In Another Kind of Public Education: Race, Schools, the Media, and Democratic Possibilities, I argue for another kind of education, one that better prepares the American public for democratic action in our contemporary social and political context. Two core questions shape this entire project. First, what kind of critical education might the American public need to picture new democratic possibilities? Second, what changes can we envision in schools and in other important social institutions that might provide this critical education? Because these questions can never be answered in any one book, I focus my discussion in this book on four important themes. First, I emphasize the persistent effects of race in a seemingly color-blind society. Because of its history, race has been tightly bundled with the social issues of education and equity in the U.S. context. Moreover, in the current, seemingly color-blind context where the next generation of Americans is increasingly of color, the United States must find a way to build a democratic national community with an increasingly heterogeneous population. Rather than equating excellence with elitism--the posture that encourages keeping people out--we might define excellence as being compatible with diversity. Only by involving a range of points of view in the democratic process will the United States get the kind of innovation that it needs. I posit that grappling with this deeply entrenched challenge to U.S. democracy should yield provocative ideas and new directions for dismantling similar social inequalities. Second, I focus on schools as one important site where these challenges are negotiated. Because public schools in America are vested with the responsibility of preparing each generation of new citizens, schools are inherently political. I also focus on pedagogy as a crucial component of democratic practice. Teachers perform vitally important duties that go beyond simply delivering job skills or acting as simple conduits for information. Rather, teachers are frontline actors negotiating the social issues of our time. Teachers are the ones whom black and brown youth turn to for guidance for upward social mobility. Teachers can be facilitators or gatekeepers of fundamental democratic ideals. Third, I focus on the media. If you define public education as public institutions teaching us about our place in the world, schools are by no means the only institution educating young people and the broader public. In this book, I would like you to watch out for how kids get another kind of public education, beyond school-based learning, from the media. Whether we like it or not, for youth, the media provides an education that often contradicts and supplants school-based learning. New technologies are the currency of youth, and a critical education requires a media literacy that prepares youth to be critical consumers of media as well as cultural creators. Fourth, I speak to and about youth. When I think about the American public, I visualize a heterogeneous population of youth, characterized by vast differences in wealth, religion, appearance, sexual orientation, gender, linguistic competency, immigrant status, ability level, ethnicity, and race. Some are in schools, others are not, and all are trying to figure out their place within American democratic institutions. I see the talent and potential in this heterogeneous population as crucial for American democracy. Yet I also see tremendous differences in opportunities that are offered to youth. In this context, just as school is inherently political, so is this youth population. As young adults in early-twenty-first-century America, youth see the challenges that face them--a deep-seated worry about the uncertain future that awaits them in such volatile times; a growing disenchantment with the seeming inability of the United States to provide equal opportunities to a sizable proportion of its youth of color; their impatience with parents, teachers, clergy, and others who struggle with the rapid technological shifts that brought the wonders of the Internet and cell phones. But mostly, the politically savvy among them see the significance of themselves as the next generation of leaders. Youth will not be following us. Rather, we will be following them. I want them to be prepared to lead me in directions that eschew complacency and put some genuinely new ideas on the table. I do not want to follow them down a path of hopelessness; rather, I want to look to them to envision and take action for new possibilities that I could not consider in my life. Therein lies the critical significance of delivering another kind of public education to youth. They will inherit not only social issues, but also the responsibility for addressing them. To meet these challenges, youth will need another kind of public education that equips them with tools to take informed action.